For nearly four years now, several of us have been trying to reconstruct a memory of our early childhood. Due to the phenomenal memory and ingenuity of Dave Spriggs ('64) of VA, we at last know the truth. Thank you so much, Cap'n Dave! I too observed the christening of the Forrestal ... from the top of the Shipyard Apartments. 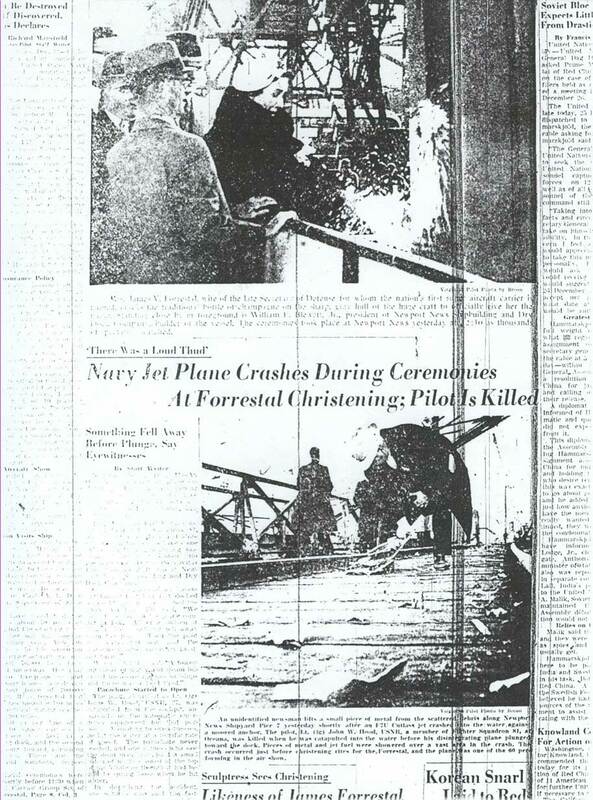 Do you remember that during the christening one of the Navy's Blue Angels crashed and killed the pilot? and feeling both awed and privileged to be there as a seven year old. I well remember the Blue Angels air show. I remember having one of the pilots autograph my Ginnette doll's pink plastic baby carrier, having no paper with me. Although I don't remember the date, the Blue Angels performed the same day as the christening. The pilot that was killed crashed just off the fantail of the ship. At the official Blue Angels site, I found no mention of fatalities. There have, I believe, been 23 since their creation in 1946. Remember, that was my favorite toy, and the ink stayed firmly attached for months, so I saw it every day, all day long. The pilot my daddy and I met was the second from the left on in the picture, Lt. (jg) Ken Wallace, who piloted #4. When USS Forrestal (CVA-59) was christened, the famous Navy flying team, The Blue Angels, were performing. During the flight over the James River one of the planes just exploded and blew apart as it pulled up out of formation. around Huntington Avenue and 64th Street at the time. and took a break to watch these famous Navy aviators go through their paces. You never fail to amaze me with your meticulous detail! Thanks, Adonis! If my memory serves me, one of the Blue Angels crashed at the Forrestal launching. I've checked their website but they don't mention mishaps. Yes, and that's one of the biggest mysteries yet! one at Jacksonville, Fl. ; one at Ontario, Canada. No operational / training fatalities occurred in the Norfolk area during this time period. If anyone can explain this to me, I'd love to hear it. Jimmy and Dave and Joe and Chuck and I didn't all just independently invent this memory. You do know that there was more than one tragedy associated with that ship. caused by the accidental launching of an anti-aircraft missile from one of the jets parked on the flight deck. What ensued was a series of other ordnance explosions as well as the burning of jet fuel which leaked to the hangar deck. It is a very famous fire and was the subject of fire-fighting training films which were shown to all sailors at least once. Thank you, David! I do remember that awful tragedy quite clearly. but it has remained with me nonetheless. Concerning the Blue Angels crash during the December 11, 1954 launch of USS Forrestal... I also can't find any reference. This was the last performance for the F9F-5 Panther planes which were propeller, not jet... and no indication of an accident then. Maybe this occurred during another launch and not Forrestal's? Maybe it wasn't a Blue Angel? Maybe it was unrelated to the launch? Ah, thank you, Eric, for checking again. I was hoping your magic powers would produce the documentation. Sigh. Regarding the Blue Angels, maybe the accident happened to the Thunderbirds. They could have been at Langley Air Force Base and substituted for the Angels that day. 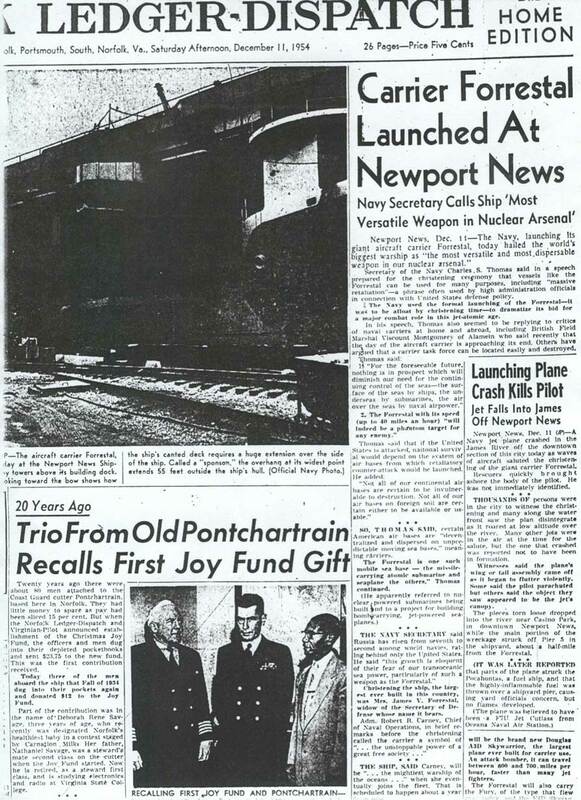 I remember the Forrestal christening but not the accident. I just don't know, Kathy. We'll have to wait to see the newspaper accounts. but then I will admit that I tend to lean toward paranoia and conspiracy theories...... GIGGLES!!! that my dad said that the aircraft which exploded was a Chance-Vought F7U Cutlass. but may have been operating out of NAS Norfolk. This will only be solved when I review the newspaper coverage of the christening. WOWZERONI!!! This is the biggest break we've had in this mystery in years! David, you never cease to amaze me! Thanks! to the identification of the pilot. but that does not square with the Navy's response, so it must have been another group of aviators flying in review that day. I am sure you will come up with some facts to set the record straight. Isn't that just incredible?!? Thanks, Joe! A quick trip by the Library ... and we have the answers. Here are the highlights; I will scan the articles soon and send to you. it was a F7U Cutlass from VF81 out Oceana NAS. there were many other aircraft flying around that day. The pilot, LTJG John W. Hood, USNR, was killed. David, you did it!!! That's absolutely incredible!!! Thanks so much! 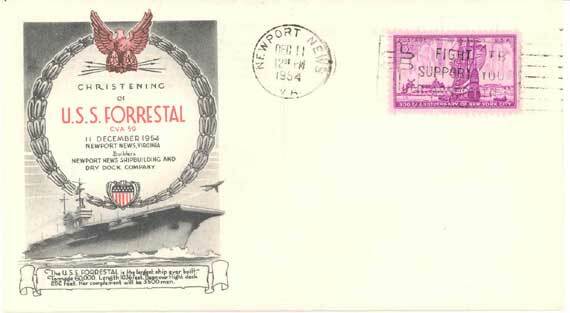 ing of the giant carrier Forrestal. "An unidentified newsman lifts a small piece of metal from the scattered debris along Newport News Pier 7 yesterday shortly after an F7C Cutlass jet crashed into the water against a moored anchor. The pilot, Lt. (jg) John W. Hood, USNR, a member of Fighter Squadron 81, at Oceana, was killed when he was catapulted into the water before his disintegrating plane plunged toward the dock. Pieces of metal and jet fuel were showered over a vast area in the crash. The crash occurred just before christening rites for the (sic) Forrestal, and the plane was one of the 60 performing in the air show." David, you are a super sleuth! Thank you so much for solving this riddle which has puzzled so many of us for so many years. You have out deepest gratitude. We salute you, Captain! Thanks for sharing the news articles furnished by Captain Dave (Spriggs - '64 of VA). He sure does his homework. or I would have known the pilot was not a part of the Blue Angels flying team. I was satisfied listening to the rumors. Dave sure had a great "flashback" regarding the make of the aircraft, given to him by his father. Very remarkable. Thanks, Adonis! Isn't that just the most incredible thing?!? I still can't get over it! The man is utterly amazing! 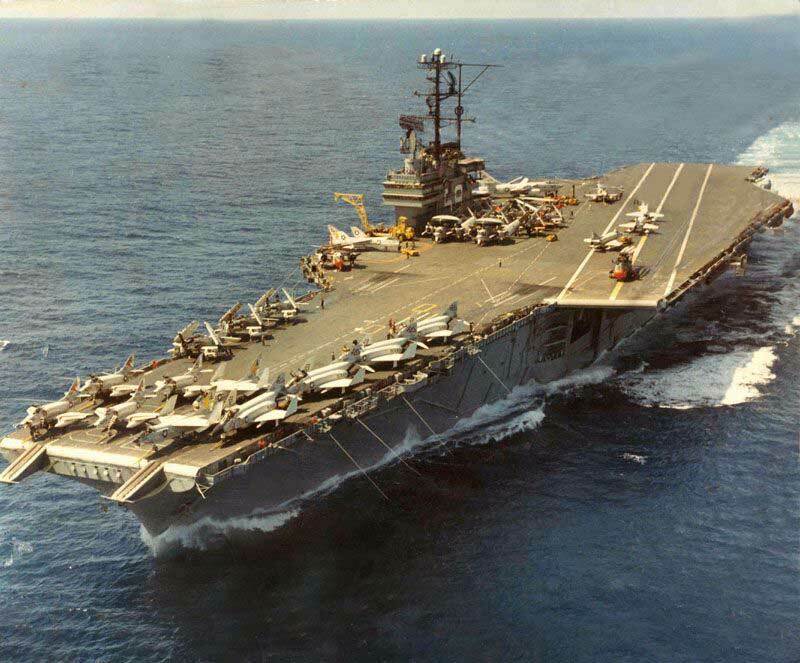 the USS FORRESTAL. I missed all of the original newsletter postings about this, else I could have shed a little light on that mystery. I was standing on the river's bank and saw the plane disintegrate in mid-air. Yes, it was a F7U Cutlass (at that time I used to be up on all the various models of cars and planes) and it was not one of the Blue Angels. First, part of the left wing fell off, flying up in the air, then most of the tail section broke off followed by the engine exploding. That was the visual sequence, but it likely started with the engine blowing up. I can recall seeing the canopy sailing upward, but don't remember seeing the pilot eject. The whole sequence took but a few seconds and I was completely stunned and saddened by it all. A few years later I was in the Ground Observer Corps where my father and I used to spend one evening a week watching planes from a little glass hut on top of the police station in Buckroe Beach. There was a direct line connected to GOC headquarters in Richmond that we used to report the heading and altitude each multi-engined plane we saw. One evening a F-104 Starfighter practice scrambling from Langley AFB flamed out and crashed in a marshy area near Poquoson. At that time the Air Force crash rescue vessel was a WWII converted PT boat powered by huge Packard V-12 engines, but the boat's draft was too deep to allow it to get to the pilot of crashed jet in this instance. I'm not positive, but I believe the pilot was killed. Not too long afterwards the Air Force got an air boat crash rescue vehicle that could go 60MPH in 6 inches of water.